The role of sedimentary invertebrates has been inferred from published studies; ratings are based on estimated global importance. Public concern is based on qualitative observations of how frequently the good or service is discussed in the popular press. Although oceans are responsible for approximately 60 percent of the estimated total value of global ecosystem services (Costanza 1999), efforts to valuate the specific roles of sedimentary biota are effectively nonexistent. 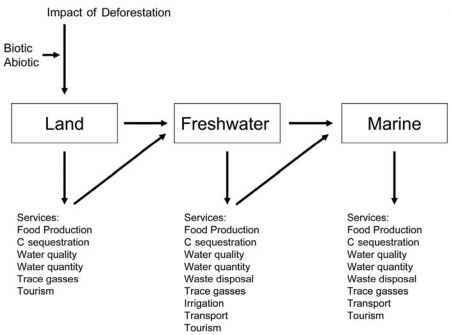 In this chapter we identify ecosystem processes that are strongly influenced or regulated by marine sedimentary systems, and consider how marine sedimentary organisms contribute to economically important extractable ecosystem goods/products (e.g., fish) and influence ecosystem services (e.g., water purification and shoreline stabilization, see Chapter 1, Figure 1.1) within the marine environment. We include a summary of important ecosystem goods and services provided by marine sedimentary biota (Table 4.1), the roles that living organisms play in delivering those goods and services, the biotic and abiotic factors that regulate provisioning of services, and specifically how biodiversity contributes to regulation and provisioning of ecosystem goods and services. The marine systems considered here are grouped into estuarine, continental shelf, and deep-sea sediments. Estuaries encompass sedimentary habitat at the land-sea interface where freshwater input measurably dilutes seawater, continental shelf sediments refer to the submerged, gently sloping seafloor between continents and the upper edge of the continental slope (~130 m deep), and deep-sea sediments include the comparatively steep (~4°) continental slope that extends from the edge of the continental shelf to the less steep continental rise (~4,000 m) that grades into the abyssal plains (4,000-6,000 m). Abyssal plains are primarily sediment-covered, flat rolling plains that cover approximately 40 percent of the Earth's surface; in some areas they contain submerged mountains known as seamounts that can extend thousands of meters above the seafloor to relatively shallow depths. Threats and sustainability of goods and services in these habitats are addressed in Chapter 7.